From Picasso’s paintings one can judge that he does not have some kind of his own style, but nevertheless his paintings almost immediately become recognizable and stand out among the rest. As for the paintings made by the master at the last period, it can be seen that he is returning to the same topics. Cloth “Kiss” is saturated with the versatility of technology. The artist worked non-uniformly on this picture, sometimes diligent strokes are seen, it seemed to be calculated to the millimeter, sometimes hasty strokes are visible. And due to the fact that Picasso’s vision has already deteriorated markedly, he had to make some adjustments every now and then. 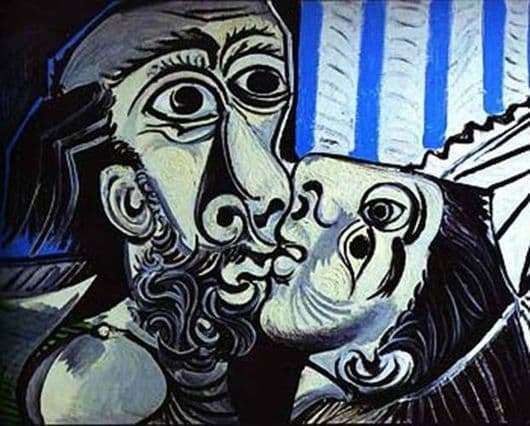 The picture was made as an ode to the all-conquering kiss and a real surge of feelings, to enhance the emotional background, the master performed it to some extent indifferent. This is evident in the facial expressions and emotions of men. First, it is clearly visible on the canvas that a man no longer merges in a passionate impulse with a woman, his eyes no longer look at her, but somewhere else. Thus, a certain distance arises between them, both physically and emotionally, it is on this fine point of understanding that the main emphasis is placed. This canvas, one of the two hundred paintings of the master, where he tries to reveal the theme of emotions in the modern world. As we can see, the separation of figures and even their deformation continues, but nevertheless, the work does not have such aggressive coloring as can be found in earlier works. Despite this, the picture directly blows revolutionism, and in many respects just such a series of pictures could change the attitude of all mankind not only to forms and figures, but also to the space as a whole. This is undoubtedly one of the merits of a great artist, who was able to change several generations of future artists with his work.